a common cyst of the skin, especially the scalp; contains sebum and keratin; lined by pale-staining stratified epithelial cells derived from follicular trichilemma. 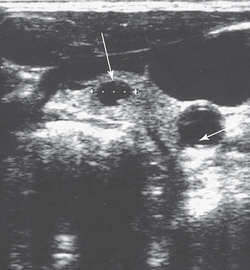 a misnomer for an epidermoid cyst or a pilar cyst. Epidermoid cyst, keratinaceous cyst, steatoma Dermatology An epidermal inclusion cyst containing greasy, pasty keratinaceous debris secreted by sebaceous glands. Cf Pilar cyst. A common lesion of the skin and subcutis containing sebum and keratin, lined by epithelium derived from the pilosebaceous follicle. A wen. A harmless soft swelling within the skin, consisting of an accumulation of fatty sebaceous material (SEBUM), the normal secretion of the sebaceous glands of the skin. Cysts develop when a gland opening becomes blocked. Sebaceous cysts, however large, are easily treated by a simple surgical operation. Cutaneous B lymphoma arising from a chronically inflamed sebaceous cyst. A metallic mole marker helps the radiologist distinguish the site of a sebaceous cyst. Out of the miscellaneous neck masses, sebaceous cyst is most common. Q I would appreciate your advice on how best to deal with a sebaceous cyst on my head. She appeared one day with a large mass on her right side that looked like a cross between an infected bite wound and a sebaceous cyst. I CANNOT be sure without seeing you but it sounds very much like a sebaceous cyst. This tumor should be considered in the differential diagnosis of head and neck lesions, which includes sebaceous cyst, implantation dermoid, neurofibroma, dermatofibroma, basal cell carcinoma, squamous cell carcinoma, pilomatrixoma, and histiocytoma. A IT is probably a sebaceous cyst which has become infected. 3) Sebaceous cyst is a common benign cyst caused by blockage of draining ducts of sebaceous glands leading to cystic dilatation of the gland as a result of accumulation of sebum.